DriveMark is an app that uses smartphone sensors to score your driving style and reward you for driving safely. We recently discovered that Malaysia is (unsurprisingly) ranked at 3rd in the world for road fatalities in emerging markets. This prompted some furious discussion between our colleagues on who the most “kiasu” (read: safest) driver in the office is. What we realised is that every group of friends has that one person who swears by everything imaginable that he/she is a safe driver, contrary to the general opinion of everybody else—and then there’s this stigma that safe drivers are “slow”. 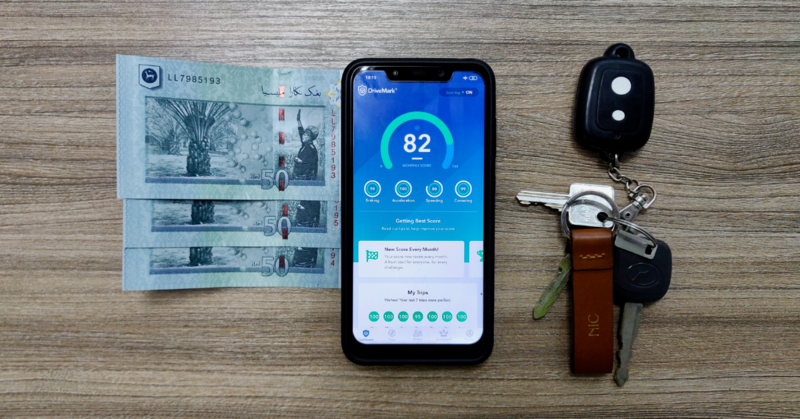 We spoke to DriveMark, a Malaysian tech company that specialises in creating a community of safe drivers, about their efforts to improve safety on Malaysian roads. In a nutshell, the DriveMark app measures your driving patterns and gives scores and rewards to you for driving safe, in the form of challenges/contests throughout the year. 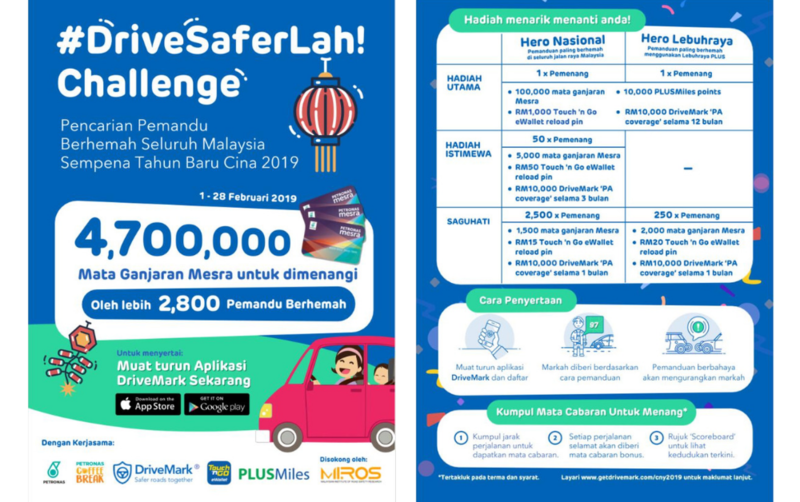 The aptly-named #DriveSaferLah challenge will be taken up a notch for the month of February in conjunction with Chinese New Year celebrations—especially when it comes to the prizes. After all, you won’t find a better time to gauge your driving skills than the usual “balik kampung” road trips. And their efforts include partnering up with PETRONAS, Touch ‘N Go, PLUS Miles, and MIROS to provide grand prizes (among others) of 100,000 Mesra points, RM1000 in Touch ‘N Go credit, 10,000 PLUSMiles points, and RM10,000 in DriveMark “PA Coverage” for a year. The challenge will be divided into 2 categories; “Hero Nasional” (the safest driver in Malaysia) and “Hero Lebuhraya” (the safest driver on Plus highways). Once you have the DriveMark app set up on your smartphone, collect “Challenge Points” by keeping a high score for every trip driven (or trying your very best to). The higher your DriveMark score, the more “Challenge Points” you earn. You can keep up to date on your ranking on DriveMark’s National Scoreboard. And of course, you’ll have concrete proof that you’re a “certified” safe driver. You can download the DriveMark app on Google Play Store or the App Store. Once installed, setting up the app and your profile settings is a decently straightforward process, with instructions on the app itself. 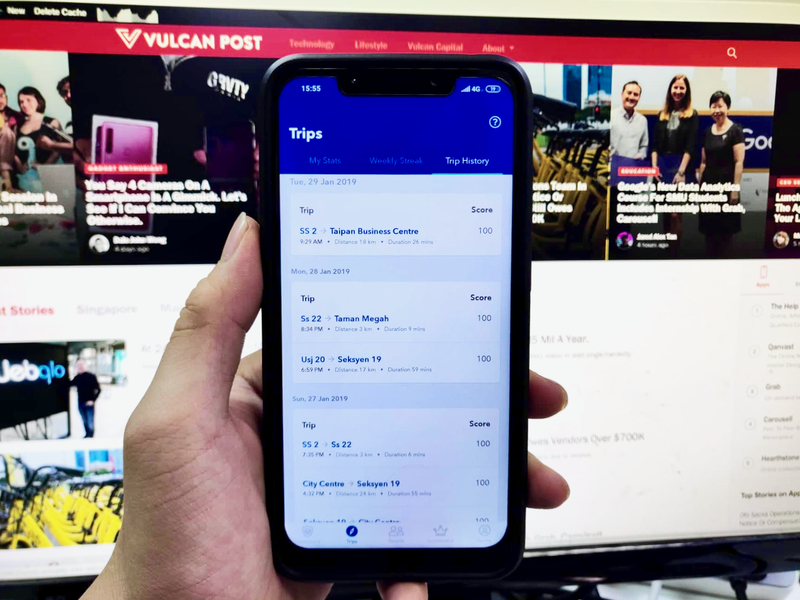 The interface on the app is pretty simple and user-friendly—you can go through your trip history, connect to your friends (by syncing your social media accounts), and join challenges. You’re given scores based on 4 main elements: speed, acceleration, cornering, and braking, with a total score given at the end of each trip. So you may be keeping well below the speed limit, but your DriveMark score will still be affected if you’re swerving recklessly or braking abruptly. At the end of the trip, you can find out your overall score for that particular trip under the “trips” tab, with the app telling you which aspect of your driving affected your score. Achieve a score of 80 and above, and you can confidently consider yourself a safe driver. You can view your trip history under the “trips” tab. Once you’ve mastered the art of safe driving, you can head here to pit yourself against other drivers in Malaysia. For these contests/challenges, the safest drivers stand a chance to win insurance coverage, Touch ‘n Go credit, or even gadgets like smartwatches and electric scooters. If you aren’t a frequent driver, you can still enter DriveMark’s special contest, which rewards users based on popularity. Pro Tip: Synchronise your DriveMark app with your contact list to find friends to invite to the app. Recent events have shown us that the importance of road safety cannot be understated. Everyone seems to rate themselves as a decent driver, don’t they? But then again, our experience has shown us that many drivers who were initially confident in their driving ability have had to accept that the truth is very different. The next time you’re having a debate with a friend on who’s a safer driver, it’d be best to have a DriveMark score to back your argument up. You can download the DriveMark app on the Play Store for Android devices or the App Store for iOS devices. If you’d like to find out more about DriveMark and KATSANA, you can visit their website. This article is written in collaboration with DriveMark.